Hollybeary Creations : Inky Paws Blog Hop with Newton's Nook! Inky Paws Blog Hop with Newton's Nook! Happy Friday everyone... 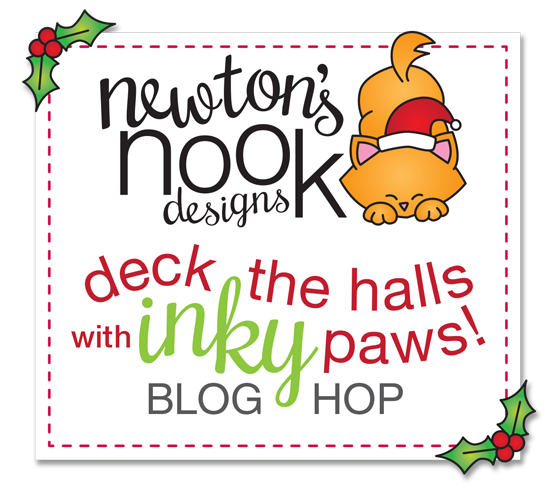 It's time for the Deck the Halls with Inky Paws Blog Hop from Newton's Nook... Join the Design Team and Guest as we share some Fun Holiday Inspiration featuring Newton Nook Design Stamps. 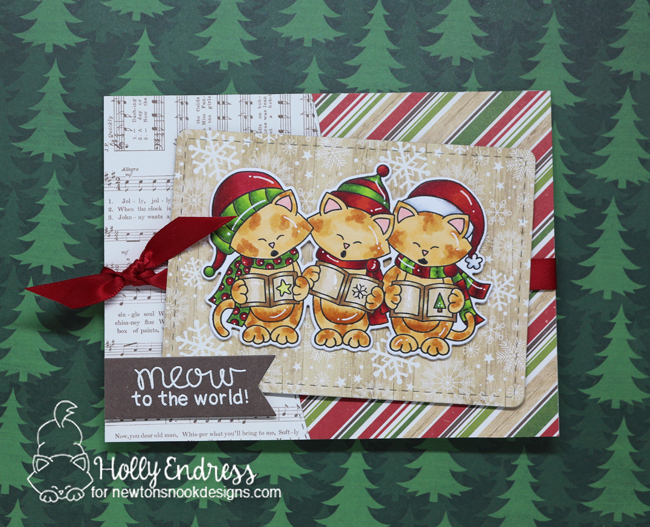 I used the Caroling Newton Stamp and Die set along with some Fun papers I had in my stash. I die cut the papers using the Land boarders and Frames and Flags Die sets. Then I adhered them to a Card base and added some coordinating ribbon. I stamped the image onto some X-Press It blending paper and colored it in with Copics. Then I used the coordinating die to cut it out. I added some highlights with a White Gel pen. I adhered the image to the center panel with some foam tape. I die cut a banner from the Frames and Flags Die set using more or the coordinating papers and heat embossed the sentiment. 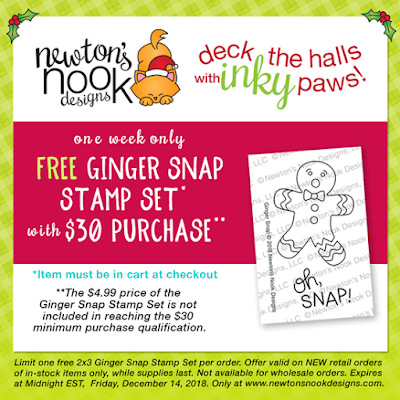 Deck the Halls with Inky Paws Exclusive! Newton's Nook Designs is also releasing a NEW mini 2x3 stamp set today called Ginger Snap!! This fun new stamp set will only be available at Newton's Nook Designs online shop and you can get it for FREE this week with a $30 purchase! Offer is valid until Friday, December 14, 2018 or while supplies last. This new stamp set is also available for purchase for $4.99. We will be choosing two lucky winners to win a $25 store credit for Newton's Nook Designs online shop! To enter, just leave comments on the Design Team Member and Guest blogs (see list below)! Two winners will be chosen at random from the collective blogs in the blog hop. Make sure to check out each of their blogs and comment for your chance to win. You will not know which blog has been chosen so the more you comment on the better your chances are of winning! You have until Sunday, December 9th at 9 pm EST to comment -- winners will be announced on the NND blog on Monday, December 10th. Fabulous card! Love those papers and your coloring of those cute kitties! Your coloring is fantastic and I really like your paper choices. Cute card! Awww!!! Your card is totally cute! This scene is really fun and your colouring simply amazing!!! Love it!!! Such a sweet musical background! Happy Holidays! I love how you paired the sheet music with the caroling kitties! Hope you and your loved ones have a wonderful holiday season! I love your card. It is very beautiful. Wonderful caroling kitties. Like the arrangement, coloring & way you added the ribbon. Great coloring and this card is fabulous! This is so adorable, I have to have it! Thanks! by two papers. Darling card. Cute cat carolers and the music paper is perfect. This is just beautiful! The colours you have chosen are perfect. Well done you! Cheers. Lovely design, Holly. I love the musical paper in the BG. Always love some type of script on a project.